There is evidence of settlement on the left bank of the Vltava already in the Palaeolithic period. By the seventh century AD the first Slav settlement occurred. The areas of the left bank continued to be populated and by the ninth century Hradcany became the fortified seat of the powerful Premyslid dynasty. With the martyrdom and canonisation of the Christian Premyslid duke, Wenceslas, in the early tenth century, Prague became a city of pilgrimage and international renown. Because of the miracles associated with St Wenceslas, Prague was raised to a bishopric in 973AD and the St Vitus rotunda – founded by St Wenceslas – became Bohemia’s first cathedral. 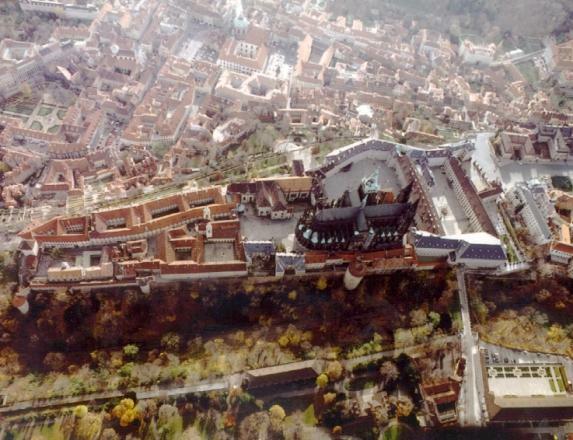 The city of Prague continued to grow in the Middle Ages particularly because of the influx of German immigrants. The Premyslid kings of the thirteenth century encouraged the settlement of German colonists because they brought with them more sophisticated administrative and commercial skills which were beneficial to Prague and the Bohemian kingdom during that time. Gradually, German burghers came to dominate the areas of Hradcany, the Lesser Quarter and the Old town. Some evidence of this early history may still be discerned in the city. There are the tenth Romanesque basilica of St George within the castle precincts, the archaeological excavations under the present Gothic cathedral of St Vitus and sections of the Royal castle. 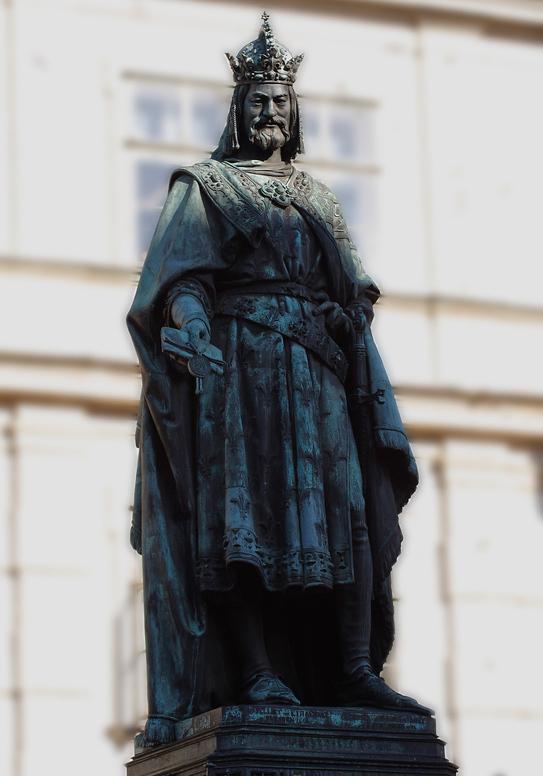 The ‘golden age’ of Prague occurred during the reign of Emperor Charles IV Luxembourg (1346-1378) when he enthusiastically pursued a monumental cultural program in order to make Prague worthy of being the new capital of the Holy Roman Empire. Among many achievements, he founded the present St Vitus’ cathedral, raised the city to the status of archbishopric, founded the first university north of the Alps, took an active interest in the decoration of the cathedral, many churches and castles in Bohemia, patronised a host of artists including the architect-sculptor Peter Parler and the Italian painter, Tomasso da Modena, and extended the boundaries of Prague by the founding and patronage of the New Town. Much of his cultural patronage was directed towards legitimising and aggrandising the Luxembourg dynasty and giving it a solid and dominant power base in Central Europe. The physical evidence of Charles IV’s splendid achievement is to be found in St Vitus Cathedral, in particular the breathtaking St Wenceslas Chapel, in which the walls are encrusted with gold and precious stones to evoke the ‘heavenly Jerusalem’. The Great South Door with its mosaic of the Last Judgement commissioned by Charles IV is also important because it is the only example of mosaic in Medieval Bohemia. In the National Gallery are to be found examples of panel painting and sculpture from this period, notably the Votive Picture of Jan Ocko, full of Caroline political ideology, and the beautiful altar-piece cycle by the Vissi Brod Master. 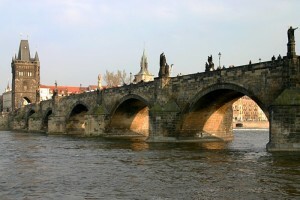 From the Caroline period is also the great Charles Bridge, named after its founder, with its unique Bridge Gate and the magnificent range of statues of saints (from the Baroque period) lining each side. These statues are believed to be inspired by Bernini’s great bridge in Rome. The Gate and Bridge were an important part of the Royal Coronation Journey between Vysehrad and St Vitus Cathedral. From the Bridge are perhaps the most memorable views of the Castle complex. When the visitor stands looking up toward Hradcany on the hill, laid out before him is a veritable compendium of architectural styles. The eye traces the outlines of clustering Gothic and Romanesque towers, envelopes the massive volumes of Baroque domes and sweeps upwards to the imposing Neo-Classical facade of the castle. Above, the Renaissance spire of St Vitus Cathedral triumphantly pierces the sky. 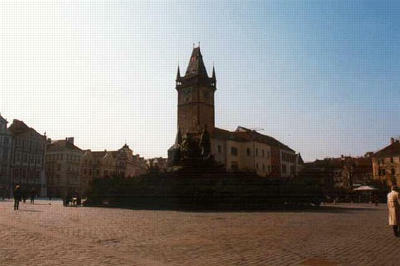 Other sites exemplifying the Gothic period in Prague can be seen in the Old Town Square with its fifteenth-century Astrological Clock (orloj) and Our Lady Before Tyn church, in the Emaus Monastery in the New Town, in many of the facades of Burghers’ houses, quaint streets, the St Agnes Convent, and in the five synagogues in Prague’s Jewish Quarter. Prague has a long and rich Jewish history which includes such figures as the 16th-century Rabbi Loew who created the fabled ‘golem’, and the twentieth century author, Franz Kafka. Apart from the five synagogues, there is the Town Hall and the unique Jewish cemetery – the oldest in Europe – all crammed into one small area. During the Nazi occupation, Prague lost much of its Jewish population, but the Jewish district was preserved, being intended by Hitler to act as a museum of an ‘extinct race’. For this reason, Prague has one of the few extant collections of Jewish architecture, art and culture in Europe. Some of the most remarkable monuments in the late Gothic style were produced in the fifteenth century, largely at the behest of King Vladislav II Jagiello (1472-1526) who, like Charles IV, attempted to use art as a way of affirming the legitimacy of his claims to the Bohemian throne. The most notable are the various rooms in the Castle, in particular the Vladislav Hall built by Benedict Reid in the final decades of the fifteenth century. The ceiling vaulting was so intricate that one of the bays collapsed and had to be rebuilt. In the St Wenceslas Chapel of St Vitus Cathedral, is to be found the most important example of fresco from this period, the cycle of St Wenceslas by the master of the Litomerice Altar. Benedict Reid was responsible for bringing the Italian Renaissance to Prague. The Vladislav Hall facade proclaimed the advent of this new era in Bohemian art, with the date 1493 written boldly in its window. However, the greatest developments in Renaissance architecture occurred during the reign of Ferdinand I, Hapsburg (1526-1564), culminating in the Mannerism of Rudolf II’s reign (1576-1612). The most notable building is the delicate and harmonious Belvedere (or Royal Summer Palace: 1535-1564), the first construction of this style to be erected north of the Alps. It was built by Ferdinand I as a pleasure palace for his wife, who did not live to see it completed. Lobkowitz Palace) and in the Lesser Quarter. One of the most interesting features used in the decoration of these palaces, not commonly seen elsewhere, is the use of ‘sgraffito’ on the facades of the buildings. This mural technique involved the engraving of decorative or figurative motifs into several layers of plaster to produce a remarkable visual effect. With the death of Rudolf II and the disastrous outcome of the Thirty Years’ War (1618-1648) the independence and political importance of the Lands of the Czech Crown declined. Referred to by some historians as the ‘period of darkness’, the Czech lands came under the uncompromising rule of the Hapsburg dynasty, whose main interest was to subjugate the Protestant elements in the kingdom and to use the wealth of the country to fund the development of Vienna as the new Imperial capital. The religious ‘re-education’ of the people was entrusted to the Jesuit Order, which immediately harnessed the emotional aspects of Baroque art to help them return the population to Catholic orthodoxy. In the hands of architects such as Santini-Aichel and the Dientzenhofers, Prague was transformed into a magnificent Baroque city of cupolas and stuccoed and colourful facades. And although the Czech writer Milan Kundera (The Unbearable Lightness of Being) has called the outburst of Baroque art in Prague ‘the flower of evil’, it has nevertheless made Prague into one of the most beautiful cities in the world. Prime among the Baroque monuments of Prague is the church of St Nicholas in the Lesser Quarter (1703-1755). The church’s vast cupola dominates the skyline of the left bank and its interior is an exuberant concoction of frescoed decoration, carved altars, sculptures, colour and gold leaf. There is also the exquisite Loreto complex at Hradcany (1721), its yellow and white facade swirling with angels and decorative motifs. From its bell tower twenty-seven bells joyously ring out a well-known Czech hymn to the Virgin on the hour. Two other great Baroque complexes are the Clementinum, which was added to constantly by the Jesuits to become the centre of the Counter-Reformation in Bohemia, and the huge Strahov Monastery in Hradcany. In both, there are magnificent library reading rooms decorated with superb frescoes. These interiors, like those of the great Baroque churches of the city, exemplify one of the most important characteristics of the Baroque, the synthesis of the three arts – architecture, sculpture and painting – to create a visually emotive, often overpowering atmosphere. Their spatial rhetoric created a compelling visual underpinning for the religious orthodoxy of Counter-Reformation Catholicism and the secular autocracy of Hapsburg imperialism. 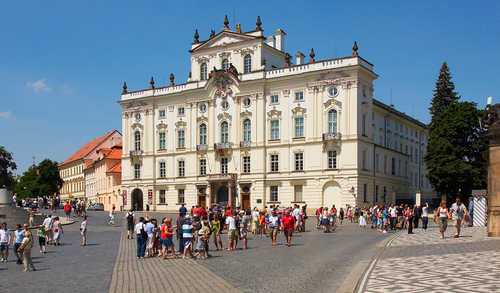 Prague also boasts a number of Baroque palaces – many with beautiful formal gardens – which were built in Prague during the seventeenth and eighteenth centuries. Examples are the Wallenstein Palace, the Thun-Hohenstein Palace, the Morzin Palace, the Schonburn Palace and the Archbishop’s Palace. Many of these palaces, like the Clementinum, were huge monumental complexes. Their vast masses heralded a subtle change in the city’s fabric, from the multiplicity and intricacy of Gothic streetscapes to the uniformity and visual coherence of panoramic vistas. The nineteenth century was the period of the so-called ‘Czech Awakening’. As with many other nations in Europe, Czech aristocratic and intellectual patriots argued for the revival of the Czech language and a renewed emphasis upon history, and culture. The period spawned a host of historians, writers and sculptors and such well-known composers as Dvorák, Smetana and Janácek, whose music was unashamedly inspired by Bohemian local traditions. This was also a period when intense lobbying of the Austrian Diet was begun by a group of Czechs led by T.G. Masaryk, in an effort to regain Czech independence from the Hapsburg Empire. 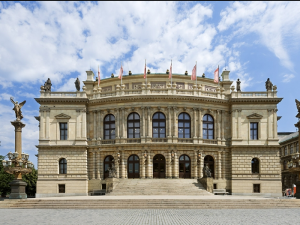 The effects of nationalism are to be seen combined with romantic historicism in the grandiose buildings of the National Theater, the Rudolfinum and the National Museum. The decoration of all three emphasizes the distinctiveness of Slavonic culture. The close of the century heralded a move away from historicist art and architecture toward the more nebulous Art Nouveau. Alfons Mucha, the famous Czech exponent of the Art Nouveau style internationally, was responsible for many of the frescoed embellishments inside Prague’s public buildings. Examples of his work are the large stained glass windows of St Vitus Cathedral and the murals inside the Municipal House. The latter, which marks the border of Old and New Prague, is one of the outstanding examples of Art Nouveau Prague. Constructivism, Monumentalism and Functionalism can quite easily be found in the city. photographs, a list of names and dates, barbed-wire crosses and flowers – sobering and sad. 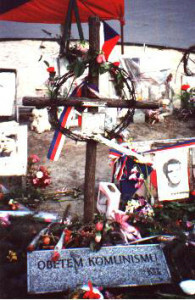 The Communist era (1948-1989) was another dark period for Czech culture and lifestyle. Largely isolated from the West and restricted by Communist ideology, Czechoslovakia ceased being a culturally vibrant, highly industrialized democracy, and became instead a stagnant backwater. Most tragically, the country lost much of its creative and intellectual talent either as it emigrated to the west (J.Kylián, B. Martinu, R. Kubelík, M. Kundera, etc.) or fell foul of the regime. The overt propaganda of the communist regime is no longer apparent. The statues of Communist heroes are gone, the Red Army tanks have been made into scrap metal, place names have returned to their original titles, the Communist star above the Bohemian emblem (the double-tailed lion) has been replaced by the lion’s historic crown. A handful of years, however, have not been able to obliterate all evidence of the Communist past. You will, therefore, encounter some examples of drabness and neglect in the form of decaying buildings, unattractive ‘social realist’ art and architecture, cheerless shop displays and dreary shop interior decors. Nevertheless, Prague is rapidly regaining its vibrancy and the richness, diversity and beauty of its cultural heritage. A massive restoration and renovation program is in progress and almost every week a newly restored architectural gem is unveiled to the delight of both locals and visitors. Arresting new monuments are appearing whose designs will once again place Prague at the forefront of architectural innovators. This is to be seen particularly in O’Gehry and Milunic’s new ‘Ginger and Fred Building’. The economic reforms have been so successful that Prague has been called ‘the model child of capitalism’. The influx of tourism has also resulted in the opening of many new restaurants, cafes and bars. Laudably, many traditional customs have been revived. Thus Prague’s new-found cosmopolitanism has been tempered by its uniquely Bohemian character. Prague is more than the sum of its history. It is a city of charm, romance and nostalgia that can generate every emotion in the visitor, from exuberant joy to tears of sentiment at the loveliness of some of its sights. It can safely be said that virtually everybody who has visited the city has been amazed by what they have seen and unreservedly consider Prague one of the most bewitching and memorable cities in Europe.